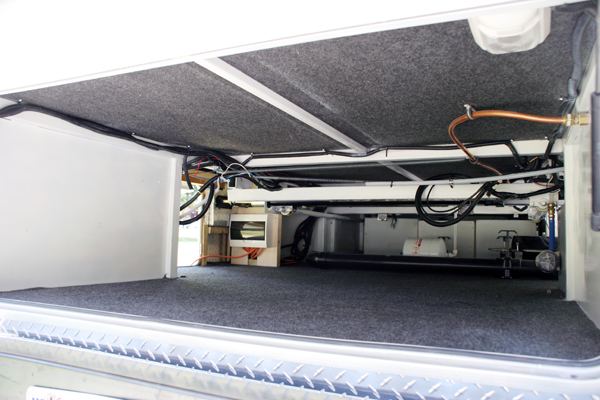 Above is the curb side of the Sequoyah Custom Fifth Wheel from Americana RV. 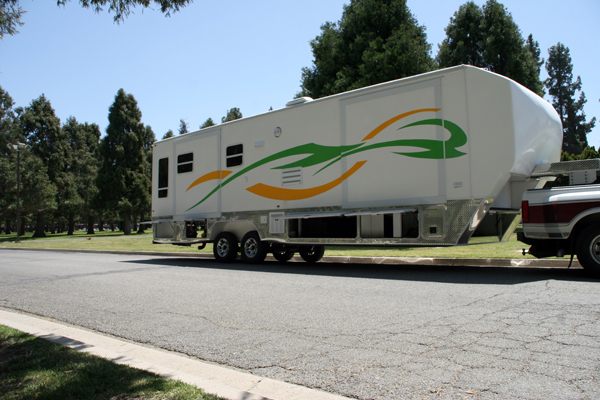 Scroll down the page to see more pictures and information about the innovative exterior features of the Americana Sequoyah Custom Fifth Wheel, including the patented box construction and huge basement storage area. For a video tour of the Sequoyah exterior features, go to the Sequoyah Exterior Video page. 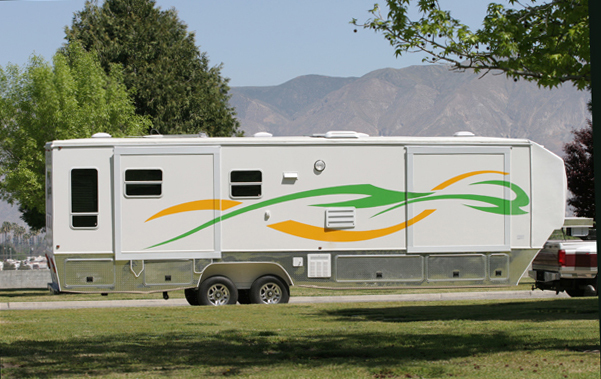 The shot above is of the road side of the Sequoyah Fifth Wheel. The rear slide-out is for the bonus room which provides enough space for an organ, sewing machine, or whatever else you can't live without. The front slideout is for the bedroom, where you'll find a full size queen bed in a stand-up bedroom without any access stairs! 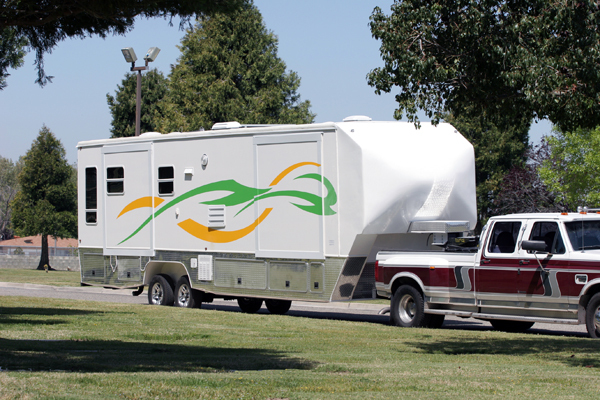 Looking at the front of the Sequoyah Fifthwheel, which creates much less drag (and therefore produces much better mileage) than most fifthwheels on the road. The roadside of the Sequoyah with the basement doors open. 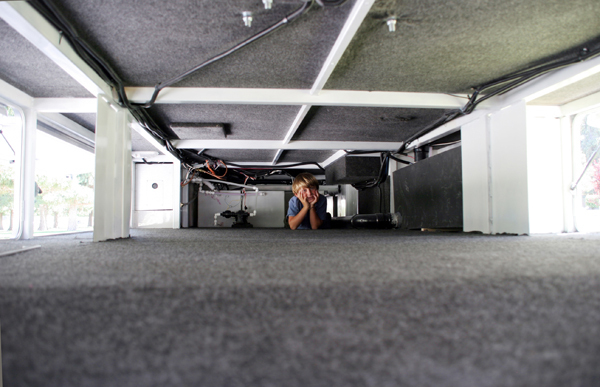 Note that there are no pipes, boxes, or anything else hanging down beneath the fifth wheel. 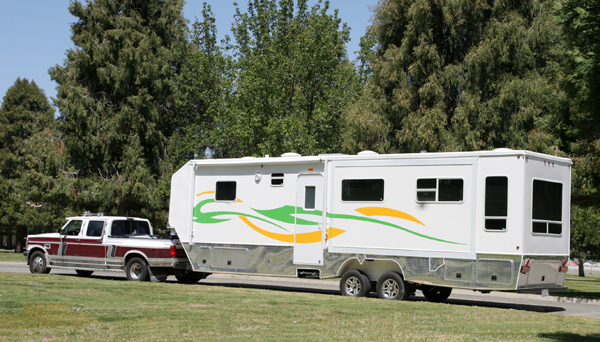 Nothing to get damaged from rocks, curbs, and other hazards, and a clean, smooth under carriage leads to better towing efficiency and better mileage. Why aren't all fifth wheels like this? 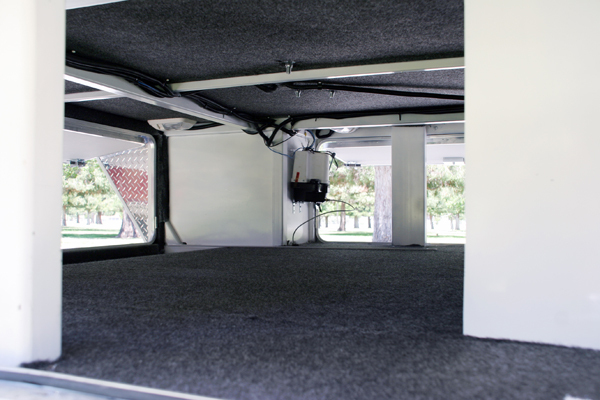 Because they don't use the Sequoyah's patented box construction which allows us to carefully place those components in a safe environment, away from the hazards of the road. Looking into the huge basement from the front of the Sequoyah fifthwheel toward the back - big enough to store kayaks, golf clubs (many times over), etc. Again, note how clean and open the basement area is. Space is only valuable if it is useable space, like what you see here. And yes, if you look closely enough you can see a grandchild way in the back. He'll crawl out eventually. This is the rear basement, behind the axles. 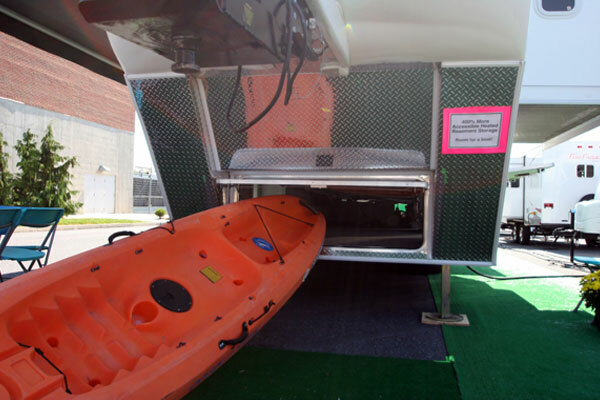 More space to store large, bulky things, or just more stuff. Pulled back a little for a longer view, you can see the size of the rear basement. Big enough for an eight year old to stretch out! One of the side access doors for the front basement. Here is the access to the front of the basement. 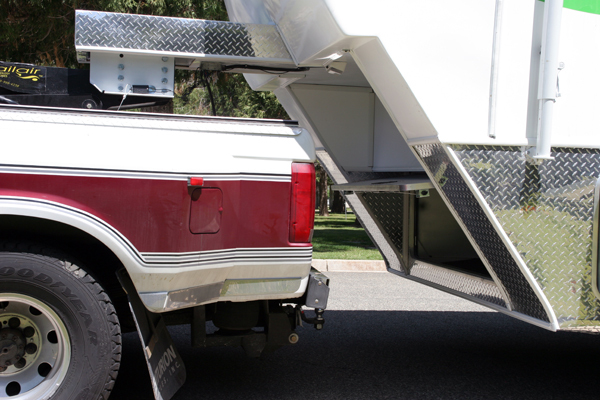 You can see that the access door is completely open even though the tow vehicle is still hooked to the fifth wheel. 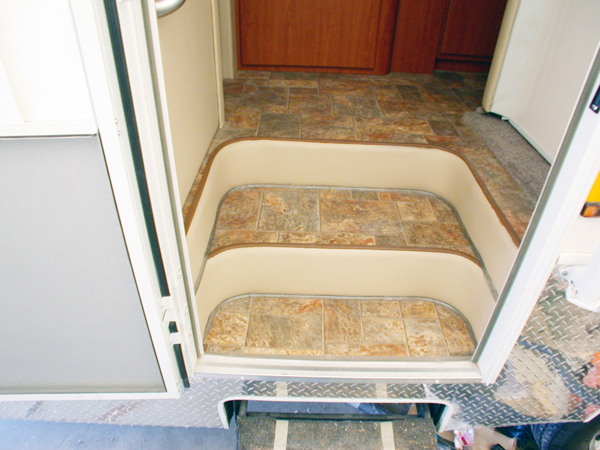 The stairs heading into the Sequoyah Fifth Wheel. Two 14 foot ocean going kayaks easily fit in that basement. 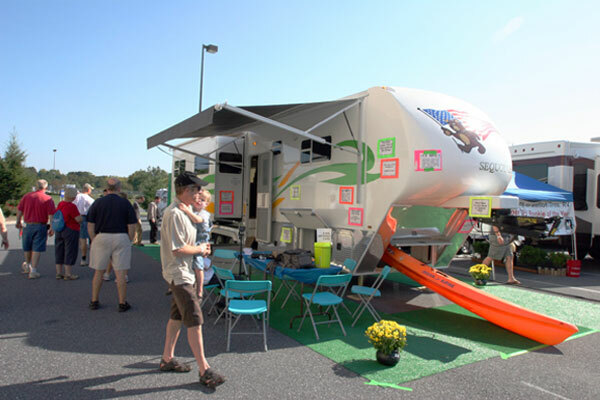 At the largest RV Show in the nation in Hershey, Pennsylvania.